Earlier this week, somebody with a sense of humour and an obvious knowledge of B.C. 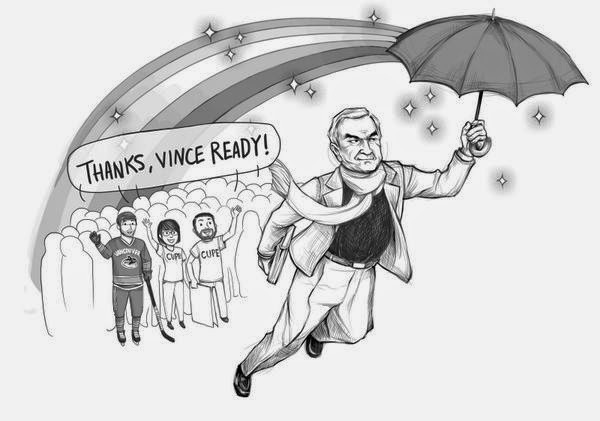 labour history swapped a photo of mediator Vince Ready for the saintly image of God in the Wikipedia entry on God. Vince Ready - our homegrown Holy One. Once bickering parties in a labour dispute learn that Ready has been called in to help them reach a settlement, you can practically hear the collective sigh of relief as everyone starts thinking about getting back to work. I'm sure Ready has all kinds of skills as a mediator, but at this point, after so many high-profile settlements between employers and employees otherwise predisposed to fight each other to the death, just the mere uttering of his name seems to signal that labour peace is coming soon. His latest loaves-and-fishes act involved the B.C. teachers' strike. But any long-time B.C. journalist such as myself knows that's just the most recent in a long string of successes. I suspect that part of his secret is that he never gets involved until both sides are wrung out and quietly wishing someone would just come along and help them save face, but he must have some extraordinary people skills as well. I've had a crush on the guy for more than 20 years. My one and only face-to-face encounter with Ready was in the lobby of the Harbour Towers Hotel, where he was mediating between the provincial government and whatever big union was furious with them at that time. I introduced myself to him as a reporter for the Times Colonist. He smiled that charming smile of his and said yes, he'd followed my work for years, and it was a pleasure to finally meet me. Even in the moment I didn't believe that he had any idea of who I was. But what did it matter? Vince Ready cared enough to flatter me with a fake story about how he'd been noticing my byline, and I swooned like a school girl. If he uses that same charm during mediation, I can see why everyone caves. After that, I became an avid observer of any labour dispute that Ready was called into, and how they always seemed to rapidly end in a settlement. I even tried to convince him to let me follow a mediation of his for the newspaper, a request that I now admit might have had something to do with me also finding him very good-looking. Back in those days and perhaps still, he presented as a blue-collar guy in a good suit, a look that I hadn't known I was partial to until swooned by him that day at Harbour Towers. At any rate, he said no, and I've never laid eyes on him again. But Vince, I think of you whenever a labour dispute turns protracted - which, in B.C., means you're never far from my thoughts. Thinking back on that distant day at the hotel when I (briefly) considered whether I should make a play for you, I couldn't have imagined there would come a day when I would say this, but thanks for getting my grandkids back to school. Lovely...he seems to be a prince all right. Thanks for the personal take Jody; I have a feeling he did follow you!